Rajkot: Mumbai were in trouble at 8/2 after Punjab rode on Mayank Sidhana's century and skipper Gurkeerat Singh's 93 to notch up 468 in their Group A Ranji Trophy match. Sidhana struck 115 off 254 balls while Gurkeerat fell seven short of a century on day two at the Saurashtra Cricket Association Stadium. The day had started with Punjab on 216 for 4, with Gitansh Khera on 4 and Sidhana on 11. Khera fell for 16 after which Sidhana and Gurkeerat came together for a sixth-wicket partnership of 178 that pushed the score past 400. However, Punjab collapsed to lose their last five wickets for 34 runs. The slide began with Gurkeerat's dismissal for 93, caught behind off Tushar Deshpande. Sidhana fell to the same bowler in his next over, and though Manpreet Gony scored 31, the lower order was dismissed quickly. 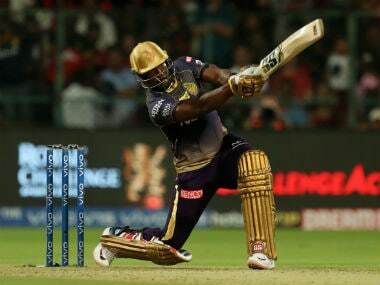 Suryakumar Yadav took a career-best 4 for 47. In reply, Mumbai's Shreyas Iyer was dismissed for a second-ball duck and Armaan Jaffer was trapped lbw by right-arm medium pacer Kamal Passi. Mumbai are behind by 460 runs with eight wickets in hand at stumps. Kolkata: Nitin Saini hit a strokeful century after a five-wicket haul by Harshal Patel as Haryana took a firm grip against Tripura in their do-or-die Ranji Trophy group C cricket match at Eden Gardens. The wicketkeeper batsman struck 22 boundaries en route to his 13th first-class century in a 103-run opening partnership with Shubha Rohila (47) as Haryana stretched their overall lead to 239 runs on day two to brighten their quarterfinal hopes. Tripura were listless with their bowling and sloppy fielding and dropped catches were the order of the day as Haryana made the best use of it. 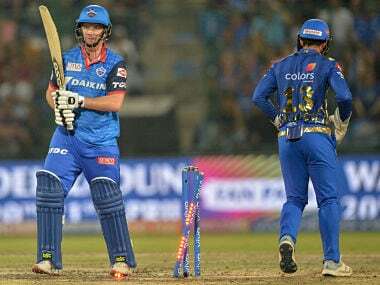 It was only towards the fag end of the day Tripura dismissed the centurion and Rohit Sharma (1) in successive overs to make it 186/4 in 43 overs when bad light stopped play. Overnight 70/4, Tripura folded for 178, of which wicketkeeper-batsman Smit Patel contributed 102, while nine of their batsmen failed to get into double digit to concede a first-innings lead. Patel held fort as wickets kept falling at the other end with Harshal claiming his eighth five-for when he dismissed skipper Manisankar Murasingh to reduce them to 140/9. But their no 11 batsman Bunti Roy (1 not out from 25 balls) gave Patel fine support at the other end in a 38-run last-wicket partnership. Haryana finally broke the partnership when Rahul Tewatia (2/10) dismissed the centurion to see their innings fold in the second over after lunch. Haryana 231 and 186/4; 43 overs (Nitin Saini 104, Shubham Rohila 47). Tripura 178; 58 overs (Smit Patel 102: Harshal Patel 5/27). Himachal 1st innings: 254/2 in 45 overs (Prashant Chopra 144 batting, Sumeet verma 70 batting). Vadodara: Saurashtra opener Kishan Parmar's unbeaten 141 enabled them to give a better account of themselves reaching 234 for 5 in the second innings but Delhi still enjoyed the upperhand in a group B Ranji Trophy encounter. Effectively, Saurashtra are only 89 runs ahead with five wickets in hand and two days of play left. 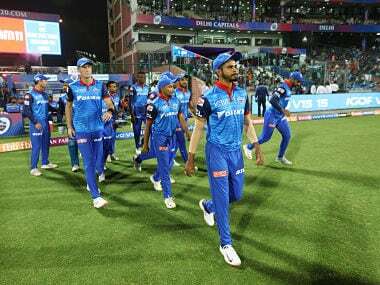 While chances of an outright victory for Delhi look bright but a chase of 150 plus would mean that bonus point can be difficult. Earlier, Pradeep Sangwan's second rearguard action of the season ensured a healthy 145-run lead for Delhi as they finished their first innings at 237. Sangwan had earlier scored a 100 against Assam. Sangwan scored 75 off 100 balls with six boundaries and four sixes to help Delhi get a lead of close to 150 runs. The stand of 47 for the with Pulkit Narang (7) also proved to be useful in the final context of the innings. Pacer Kushang Patel grabbed 5 for 72 in 17.3 overs. When Saurashtra came into bat, Snell Patel (4) and Divyaraj Chauhan (0) were out quickly but a 94-run stand between Parmar and Sheldon Jackson (40) steadied the ship. Soon Jackson, Jaydev Shah (1) and Prerak Mankad (6) were out in quick succession to reduce Saurashtra to 130 for 5. But Parmar and Arpit Vasavada (25) added 104 runs for the sixth wicket to guide Saurashtra to a 89-run lead so far. Delhi 1st innings 237 (Pradeep Sangwan 75, Rishabh Pant 40, Kushang Patel 5/72). Nasik: Three centuries were scored alongside a 51 from Irfan Pathan on day two of the Ranji Trophy Group A between Baroda and Uttar Pradesh. Uttar Pradesh, resuming their first innings at 360 for seven, ended up with 480 thanks to Kuldeep Yadav and Saurabh Kumar, who made 117 and 105 respectively. In reply, Baroda were 242 for five at close of play with opener Kedar Devdhar staying unbeaten on 120 as well Pathan on 55. Baroda still trail UP by 239 runs. It was a freewheeling knock from Pathan who smashed seven fours and a six in his 55 ball knock. Devdhar on the other hand collected 13 fours. Brief scores: UP 481 in 115 overs (Yadav 117, Saurabh 105). Baroda 242/5 in 63 overs (Devdhar batting 120, Irfan Pathan batting 55; Ahmed 3/58). Greater Noida: Left-arm paceman TM Ul-Haq returned career-best figures of six for 21 as Rajasthan bundled out Vidarbha for 116 to take a crucial 24-run first innings lead in their Ranji Trophy Group B match. Vidarbha started the second day at 14 for none, hoping to cross the Rajasthan first innings total of 140 but ended up conceding a narrow lead as TM Ul-haq routed their middle and lower batting order. 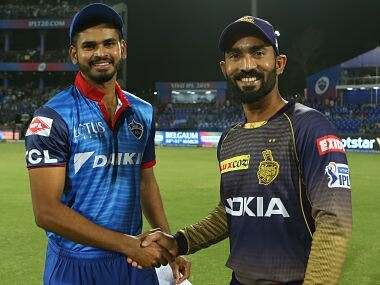 It was Aniket Choudhary, who provided the breakthrough with the wicket of rival captain Faiz Fazal (17) and Vidarbha could never settle the innings. Paceman Pankaj Singh (3/52) removed Ganesh Satish (4) and Siddesh Wath, who was top scorer for Vidarbha with his 50-run knock. Opener Sanjay Ramaswamy was the next best 25-run knock. TM Ul-Haq just wiped out the remaining batsmen to record his best-ever figures in first class cricket. Rajasthan 10 for no loss in their second innings with openers Amitkumar Gautam (5) and Manender Singh (4) at the crease as they negotiated 11 overs without being separated. Rajasthan 140 and 10 for none in 11 overs. Vidarbha 1st innings: 116 all out in 41.3 overs. (S Wath 50, R Sanjay 25; TM Ul Haq 6/21, P Singh 3/52). 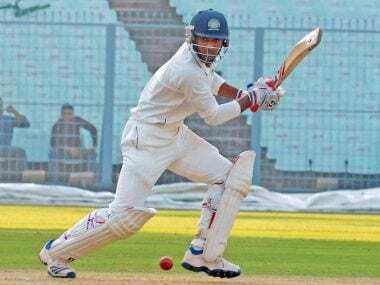 New Delhi: Shreevats Goswami finally came out of Wriddhiman Saha's shadow to hit a career best 225 which enabled Bengal post a commendable 475 for 9 on the second day of the Ranji Trophy Group A league encounter against Madhya Pradesh. At stumps, MP were 19 for 1 with Ashok Dinda getting the wicket of Aditya Srivastava. The day belonged to Shreevats, who played 328 balls hitting 25 boundaries and three sixes en route his maiden double hundred in First Class cricket. It was also a match where Bengal's lower order showed exemplary resilience as the last three wickets produced 268 runs after being reduced to 207 for seven. More so Shreevats along with No 11 Sayan Ghosh (20 no) added 119 runs for the unbroken 10th wicket. They broke a 77 year old record which stood in the name of B Malcolm and TS Bhattacharjee, which was 115 against erstwhile Madras during the 1938-39 Ranji season. Apart from last wicket stand, there was a 92 run stand with Veer Pratap Singh (24) for the ninth wicket. It was this partnership that broke Madhya Pradesh's morale after their premier keeper Naman Ojha sat out after sustaining a finger injury which seems like a hairline fracture. It wasn't like Shreevats' innings was blemish free but he was ready to wait for the loose deliveries and also bat responsibly with the tail taking singles off fourth and fifth deliveries. He got a life on 97 when he tried to cut off break bowler Shuvam Sharma but the point fielder dropped a dolly. He breached the 100-run mark with a streaky boundary off Puneet Datey through vacant second slip region. Shreevats' drives were a sight to watch especially the punch he packed in them. He slogged swept left arm spinner Ankeet Sharma for a six and Shuvam for six over long off. The double hundred came when he tapped Chandrakant Sakhure towards backward short leg for a single. It was the only time that Shreevats showed some emotion as he acknowledged the cheers from the crowd. Even national selector Sarandeep Singh applauded the effort. Brief Scores: Bengal 475/9 decl (Shreevats Goswami 225, Abhimanyu Easwaran 80) vs MP 19/1.